A high-ranking Egyptian intelligence officer ridicules Palestinian Authority President Mahmoud Abbas in a leaked telephone conversation with exiled Palestinian strongman Mohammed Dahlan, it was revealed Saturday night. Abbas was referred to as “stupid,” and his movement Fatah “screwed,” by Major General Wael el-Safty of Egypt’s General Intelligence Directorate (GID), which is responsible for providing national security intelligence both at home and abroad. The leaks may be unwelcome in Cairo for a number of reasons: Safty is in charge of the Palestinian portfolio for the GID, and the controversial Dahlan has already been accused of receiving Egyptian backing to replace Abbas. This recording is only the latest in a series of leaks from the heart of Egypt’s military state. The telephone conversation may also embarrass Egypt in its attempts to play honest broker in mending a feud between Abbas and Dahlan. The leaks were broadcast on Mekameleen, a Turkey-based Egyptian satellite television channel known for its support of jailed Muslim Brotherhood leader Mohamed Morsi, Egypt’s first freely-elected president, who was overthrown by the army on 3 July 2013 in a military coup. Previous tapes leaked by the TV channel have been examined and authenticated by the leading British laboratory of forensic speech and acoustic analysis, JP French Associates, headed by Peter French, professor of forensic speech science at the University of York. The laboratory provides forensic voice analysis to the British courts, as well as advice and training to international law-enforcement agencies. The fact that sensitive conversations by top Egyptian officials are being bugged and leaked to opposition media attests to tensions within the highest reaches of the Egyptian security establishment. In the latest leaked recording, only the Egyptian side of the conversation is audible. Safty’s voice is heard, but not Dahlan’s responses. Still, it is obvious that the person on the other end of the telephone is Dahlan, because he is referred to by his kunya, or traditional Palestinian name, Abu Fadi. Furthermore, after exchanging pleasantries, Safty asks about members of Dahlan’s family by name. “Abu Fadi, the years are passing,” the Egyptian intelligence officer reminisces early on in the tape. Soon thereafter, they begin talking about someone whose “concentration isn’t at full capacity”. Safty then says this person “has nothing to offer”. The tapes go on to make clear that the man they are talking about is Abbas, 81. The implication here is that Abbas is repeatedly churning out old ideas without bringing anything new to the table. Camels, like cattle, are ruminant animals that digest then re-digest their food a number of times. At this point, the conversation turns from petty insults to expressions of real frustration with Abbas. Safty lets loose. “He can’t even contain the factions [within Fatah],” he says. “These are the ones that Abu Mazen [Abbas’s kunya] couldn’t contain, these people drove me absolutely crazy, their positions have begun to align with Hamas. “He can’t bring them together,” Safty tells Dahlan in utter exasperation. “I swear, he can’t bring them together. MEE previously reported on a joint Egyptian-Jordanian-UAE plan to install Dahlan as PA president in a post-Abbas era. Dahlan has been exiled from both Gaza and the West Bank and has close ties to the UAE monarchy. In the Gaza Strip, Dahlan is still hated for his attempted putsch after Hamas’s electoral victory in 2007. In the West Bank, last August, Abbas cracked down on weapons stockpiling as various factions were preparing for a post-Abbas landscape. Palestinian security officials and senior Fatah figures told MEE that it was Dahlan who had sparked the arms race, by arming his followers in areas where he still retains support. Abbas continues to refuse reconciliation with Dahlan. Previous leaks by Mekamaleen have also exposed far-reaching UAE interference in Egypt, coordination with the UAE in delivering weapons to Libya and funneling funds to Tamarod – a movement that was established to gather popular support against Morsi. The recordings were primarily attributed to Abbas Kamil, a manager of the office of Egypt's President Abdul Fattah al-Sisi. The torrent of leaks gushing from the heart of the Sisi government undermines his image as a strongman ruler. The GID is one of three intelligence services, with the other two being the Office of Military Intelligence Services and Reconnaissance (OMISR) and the Egyptian Homeland Security (EHS). Egypt’s intelligence community have notoriously strained internal relations, with conflicts between the GID and OMISR being blamed by one previous director for a failure to predict the 1967 Arab-Israeli war. The GID regained its prestige by playing a critical role in Egypt’s victory in the October 1973 War against Israel. But in Egypt today, the GID is chiefly remembered for its notoriety in the late Mubarak period, and even more so for its infamous director Omar Suleiman, who ran the directorate from 1993 until the 25 January revolution in 2011. The importance of the GID was underscored by the fact that it was Suleiman who announced Mubarak’s resignation on 11 February 2011. The former GID director died the following year. The intelligence services form one pillar of the triumvirate that governs Egypt’s security state, with the other two being the army – which overthrew the British in 1952 and founded the Arab Republic of Egypt – and the police, who were empowered under Mubarak to counterbalance the power of the military. It was not just Abbas the two men made ridiculed over the phone. The man they are mocking is Azzam al-Ahmed, a senior Fatah member, member of the Palestinian Legislative Council and PLO ambassador to Iraq between 1974 and 2002. The photo in question is innocent enough. 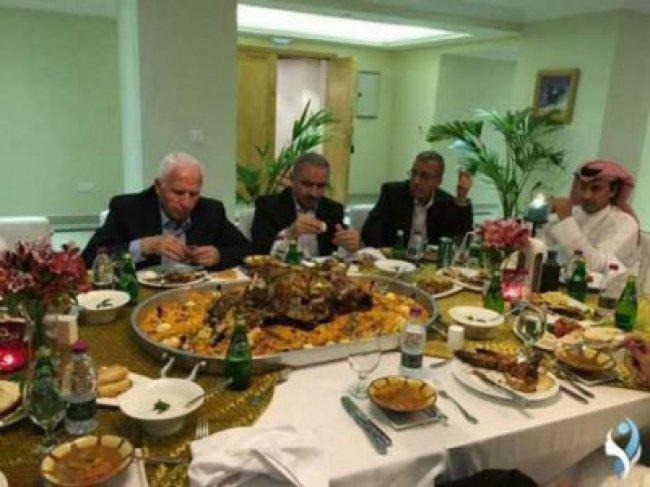 Al-Ahmed was simply eating a traditional Arab dish of lamb and rice with his hands at a conference in Qatar. Al-Ahmed has, however, publicly and vigorously condemned Arab involvement in Palestinian affairs. Safty asks Dahlan if he should register the number he called him on, and after promising to do so, the call ends.